We have room in total for 50 guests but smaller groups are equally welcome too. There are 12 bedrooms of varying sizes, accommodating from 2 to 10 guests and distributed across the 1st and 2nd floors. An en-suite with disabled access room is situated on the ground floor and there is a chair lift to the first floor. There are shower and toilet facilities throughout the house with a separate leaders bathroom. 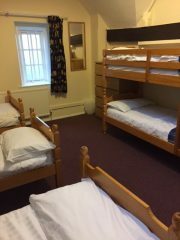 The centre has full central heating and all bedding is provided. 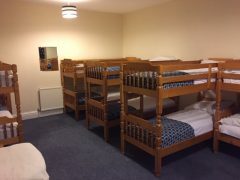 Apart from the en-suite on the ground floor, all bedrooms are on the 1st and 2nd floors with facilities on both floors. 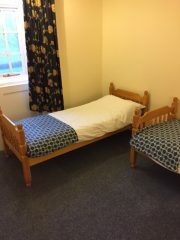 The use of rooms is entirely at your discretion, though you may wish to accommodate boys and girls on separate floors for ease of supervision. A floor plan is available here.